Memberships still available! Info here and membership forms. Thank you! So it turns out I’m an awful blogger. Witty and insightful posts, half finished and abandoned at one in the morning, an old phone too full of old pictures to take any more. So many recipe ideas! But rest assured, I’m pretty okay at farming, and the season is coming along nicely. Right now, it feels like it hasn’t rained since June, but even though there are always outside forces making it all ‘less-than-perfect,’ the perfect shows itself anyway. The perfect bunch of radishes, the sheen of a well-cured red onion, jewel-like quarts of cherry tomatoes. Turkeys running for lettuce scraps in the glow of sunset. Spying on CSA members from the kitchen window as they consider their tomato choices. Happy and grateful. Thanks everyone. Onions, garlic, shallots, leeks. Scallions, chives, and ramps. They are all alliums, collectively indispensable in cooking. And among the first seedlings to sprout in the greenhouse. Alliums are monocots, which means they have one cotyledon. Cotyledons are the first tiny little leaves bound up inside the seeds, waiting for water to penetrate the seed coat, waiting to burst out into the light. I particularly love the way alliums germinate. Unseen in the soil, a little root, the radicle, will be the first part of the plant to emerge. As it pushes it’s way down, a tiny little loop of that first leaf will push it’s way up through the soil, growing taller as it elongates. Finally the tip of the leaf will be pop up out of the soil, with the seed coat attached to the end. I love imagining what is happening inside the tiny plant, how it really grows. At the tips of the radicle and cotyledon, cells rapidly divide, then get bigger before differentiating into specialized cell that carry out all the functions the plant needs to thrive. This is a microscopic view of an onion root. It is stained to show the cells clearly. Isn’t it beautiful? 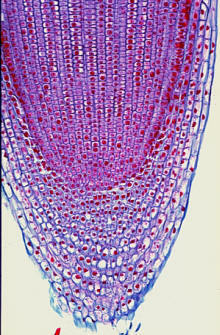 The clearer cells are the root tip, generalized cells whose function are to protect the root apical meristem. The meristem is where all primary growth occurs, where cells divide to send the roots deeper into the soil. Members of the onion family are also among the first to start growing outside without the help of greenhouses or low tunnels. Garlic, chives, ramps, and other perennial onions. (I would include some pictures but ours were recently stampeded by chickens.) And then there are the garlic and onions that have been in our basement all winter, even they want to start growing. As soon as I bring them into the kitchen they send out shoots, here they are in action. While they might look similar right now with their little shoots, they don’t share the same plans for the future. If they were in the soil, the individual garlic cloves would grow into whole new bulbs, ready for harvest in July. The onion would send up a flower shoot, producing seeds mid-summer. Seeds that could be germinating about this time next year. Somehow, it seems just right that I start this website in the wee hours of a leap-day. Time squeezed in between the cracks. And a lot like farming, I’ll be figuring it out along the way, so it might be some time before this is a ‘whole’ website. You will, though, find info for this year’s CSA in the tool bar above. And rest assured, the less time I spend at the keyboard, the more I have for growing your vegetables!